An artist's illustration of the Beresheet moon lander built by SpaceIL and Israel Aerospace Industries in space. 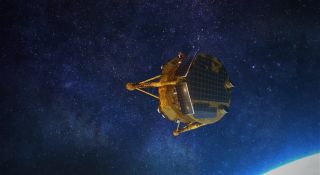 The lander entered orbit around the moon on April 4, 2019, a first by Israel and a private lunar lander. SpaceIL and Israel Aerospace Industries team members celebrate the successful arrival of the Beresheet lunar lander in orbit around the moon on April 4, 2019. And today, the moon reached out and grabbed Beresheet. The milestone came after a 6-minute engine burn, which began this morning at 10:18 a.m. EDT (1418 GMT). This braking maneuver reduced Beresheet's velocity relative to the moon, allowing lunar gravity to capture the craft, project team members said. A look at the long, looping path the Israeli lunar lander Beresheet took to the moon. This outreach work has already begun. SpaceIL personnel have met with more than 1 million Israeli schoolkids since the nonprofit was created in 2011, mission team members said. And Beresheet's handlers have released photos from Earth orbit showing the lander's Israeli flag in the foreground and its home planet in the background.